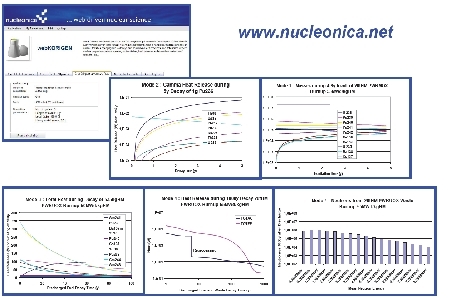 A web-based KORIGEN package for nuclide depletion calculations in NUCLEONICA. Industrial power plants as pressurized-water reactors (PWRs) or boiling-water reactors (BWRs) are charged with UO2 and/or mixed PUO2 and UO2 fuel assemblies. Under nominal operating conditions, the fuel undergoes depletion during in-core residence which is caused by fission processes generating fission products and by neutron capture processes transmuting U to Pu and Pu to Am, Cm and heavier transplutonium elements. The discharged spent fuel changes its composition due to radioactive decay and spontaneous fission processes, the decay being accompanied by strong release of heat. Reliable assessment of nuclide inventories and decay heat from actinides, fission products and activated fuel impurities is a key issue in the design of core cooling systems and evaluation of their performance as well as for the safe handling, reprocessing and storage of spent fuel. Moreover, integrated accident consequence analyses for nuclear facilities require additional information on the fuel elemental inventories and their isotopic break-down as a function of time to allow the evaluation of eventual volatile releases and the radiological dose to members of the public. Four operational modes can be run. They constitute a representative subset of the variety of KORIGEN abilities, dedicated data libraries and code miscellaneous options: (1) Irradiation of a reactor fuel or a target (one KORIGEN phase); (2) Decay of a single-nuclide radioactive material (one phase); (3) Analogue to 1, but extended to subsequent decay (two phases);(4)Analogue to (3) with subsequent reprocessing and decay of waste added.